10.3" x 5.3" stitched on 14 count. 8.0" x 4.1" stitched on 18 count. 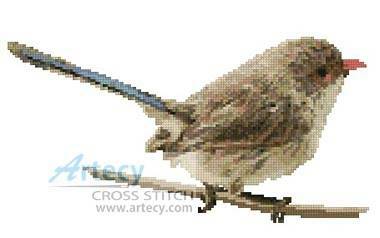 Female Splendid Fairy Wren cross stitch pattern... This counted cross stitch pattern of a Female Splendid Fairy Wren was created from a photograph by Eve Parry http://www.flickr.com/photos/12616079@N00/. Only full cross stitches are used in this pattern.